Our V-3 (at right) is the largest vacuum molding unit in the world. Plastic is drawn onto the pattern by a vacuum. A second sheet of plastic is placed on top of the sand and a vacuum is applied to the flask. Atmospheric pressure then hardens the sand retaining the shape of the pattern. 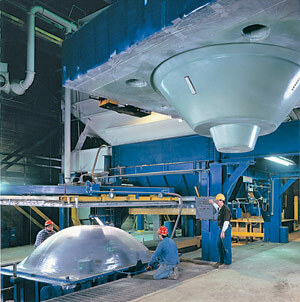 After cooling, the vacuum is released, producing a sand-free, finished product.